We all know Michael Faraday and his pioneering work into electromagnetics, but he was not the only technically-minded member of his family. His elder brother Robert ran a gasfitter’s and lighting company in Wardour Street. The land Tax records tell us that he had his business there at least since 1823 and in Pigot’s Directory of 1825, Robert is duly listed as brass manufacturer and founder at number 114. But laying gas pipes was not all Robert did, he was also heavily involved in the development and installation of more efficient lamps. 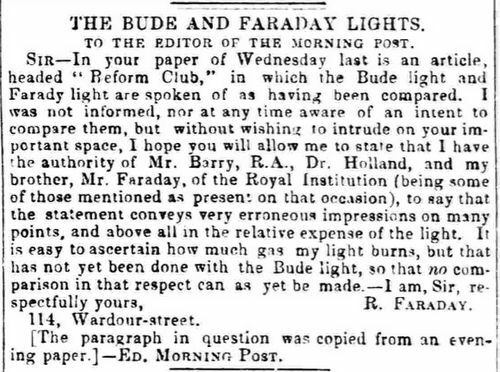 In 1841, for instance, he installed new lighting at Tichborne Street School for the Paddington Schools Committee, and in 1843 he reacted to a report in the newspaper on a comparison made between the Bude and the Faraday lights. Bude lights had been invented by Goldsworthy Gurney and worked by introducing oxygen into the interior of the flame. Please note that The Morning Post tried to blame the original report on the evening paper from which they had copied the article. Robert’s brother Michael had struck on the idea of ventilation in lamps when he worked with lighthouses, but he gave the invention to his brother, “I am most happy to give freely all my rights in it over to you”. (1) Robert received the patent for the improvements in ventilating gas- and oil-burners on 25 March 1843. 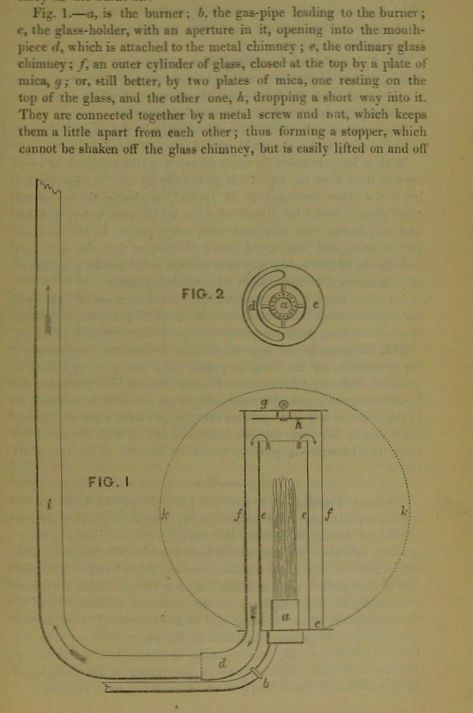 (2) Earlier that same year, Robert’s son James wrote a booklet about the issue, Description of a Mode of Obtaining the Perfect Ventilation of Lamp-burners, explaining the mechanics involved. 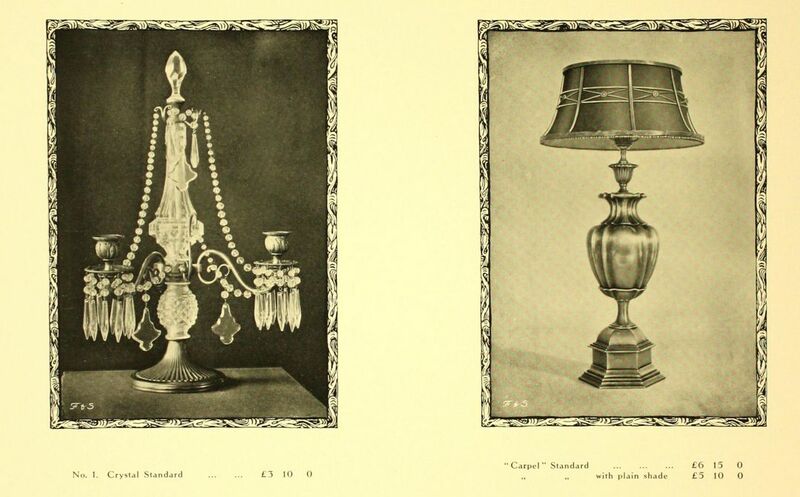 The firm’s entries for the Electric Light Fittings Exhibition in Edinburgh received a favourable review in The Art Journal of August 1890; their designs were qualified as “of a novel and artistic character”, and the design of a Cupid holding a lamp aloft was given as an example of “a good design”. The Colonies and India newspaper of 9 April 1892 reported on another exhibition and said that “the admirable, sometimes severe, taste of Mr. Harold Faraday in artistic design is proverbial, and had never had more effective demonstration than in the fine display made by his firm at this exhibition. 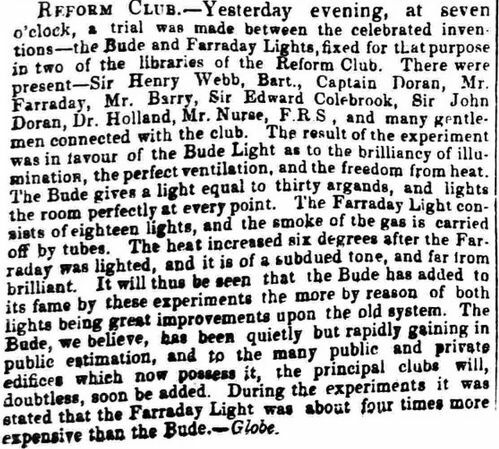 Mr. Faraday’s object … appears to be to differentiate electric-light fittings as far as possible from gas fittings. … Mr. Faraday’s designs have a distinction of their own”. 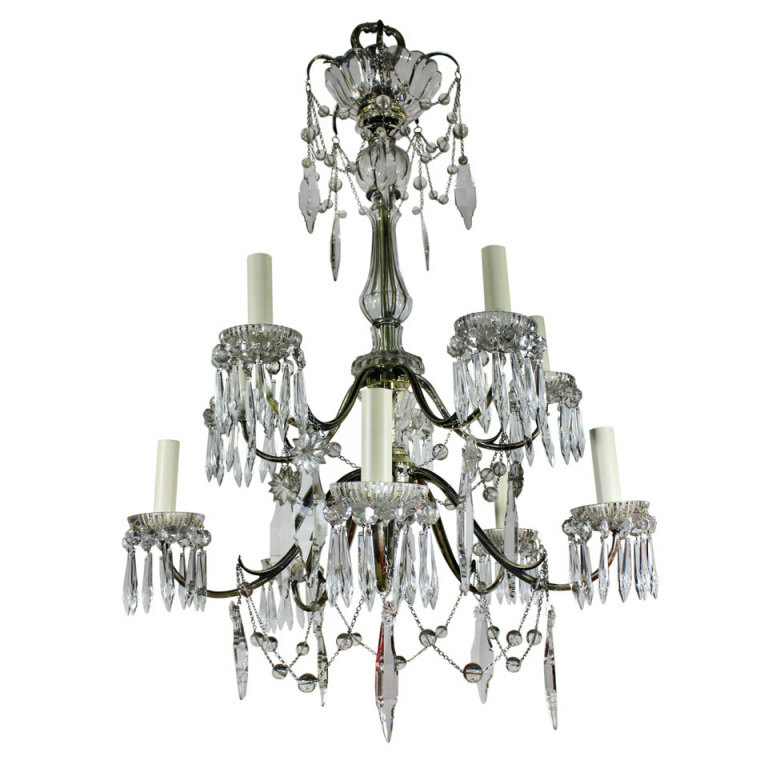 In 1919, another company, specialising in chandeliers and Faraday’s merged to become Osler and Faraday Ltd, working from Wardour Street until 1925. They also had a showroom in Berners Street and various other cities in the UK. More on the history of the Osler company and how they ended up as part of Wilkinson’s PLC can be found here. (1) The Life and Letters of Faraday, ed. Bence Jones, vol. 2 (1870), p. 166″>(1) Robert received the p.
(2) Newton’s London Journal of Arts and Sciences, 1843. (3) The Morning Post, 13 August 1846, and Daily News, 15 August 1846. (4) England & Wales, National Probate Calendar (Index of Wills and Administrations), 1875. Estate valued at under £6,000. (5) See for a description of Breadalbane House: ‘Park Lane’ in the Survey of London, Volume 40, the Grosvenor Estate in Mayfair, Part 2 – British History Online and for a picture of the ball room (fig. 68c) here. The 1838/40 Street View shows an empty property at 70 Strand, but by 1847 when the Supplements were published, the premises are occupied by Freeman Roe, “Hydraulic engineer and fountain maker”. He advertised his hydraulic water rams in The Gardeners Chronicle and agricultural gazette of 14 March, 1846, also listing the other devices he could supply: jets, baths, steam closets, cooking apparatus, fountain basins, water purifiers and, slightly at variance with the chunky hardware, the Agricultural Chemical Almanac. I have not been able to locate a copy, but another book from his hand, The Hand Book of Fountains, and a Guide to the Gardens of Versailles (1845) can be found at the British Library. Roe’s hydraulic ram receives favourable attention in The Mechanics’ Magazine and one of his pumps can still be seen at the Lost Gardens of Heligan in Cornwall. In June 1851, Roe and one William Hanson dissolve their partnership “by mutual consent”. (1) A bit strange that they only feel it necessary to announce the break in September, but that may have had something to do with the Great Exhibition where they displayed hydraulic pumps, fountain basins of iron for pleasure grounds, and a four-horse portable steam-engine for agricultural and other purposes. (2) The Farmer’s Magazine of August 1854 reported on an agricultural show at Lincoln where Roe displayed his wares, giving the prices of the various goods. A farm fire engine, for instance, could be had for £12 12s. and a common pump could be supplied for £1 15s. A later issue of the magazine (August 1855), reporting on a meeting in Carlisle, shows roughly the same products and prices, but gives William Freeman Roe of 70, Strand (his son, see below) as the supplier. Freeman Roe was originally from Thrapston, Northants. 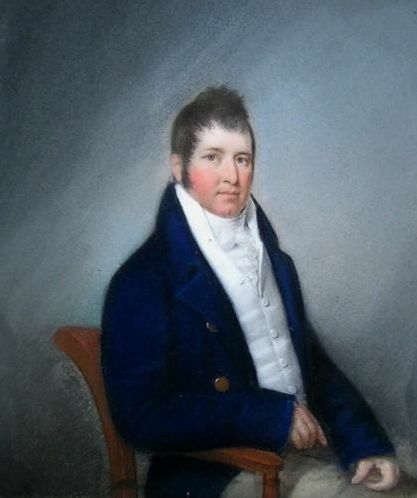 He married Elizabeth Hill on 5 February, 1833 in Islip. Their son, William Freeman, is born 6 April 1834 at Camberwell, Surrey. Roe marries a second time, in 1843, at St. George Hanover Square to Susan Thorne, originally from Frome, Somerset, and they have six children: James, Timothy, Mary Ann, Susan, Hannah and Charles. (4) According to the 1851 census, the family lives at Jews House, Bridge Field, Wandsworth. Son William marries Louisa Simpkins at St. Pancras Church on 17 August 1858. On the wedding certificate his occupation is listed as mechanical engineer. By 1861 the other family members have moved to 4 Church Row, still in Wandsworth. Freeman himself died 28 March 1870 at Eton Park House, Fellows Road, Haverstock Hill (now part of Camden). His widow Susan received probate; the value of his estate was less than £300. (5) In 1871, Susan and two daughters, Mary Ann and Hannah, are running a school in Fellows Road. Ten years later, they can be found at 100 Adelaide Road, Hampstead. The girls still have ‘teacher’ as their occupation. By 1891, they are still there, but now James, civil engineer, and Timothy, wine & spirit agent, have also moved in. Mother Susan dies on 29 November 1893 and probate is granted to Mary Ann and Hannah; the value of the estate has risen to just over £600.(6). By 1901, the men have moved out again, but Mary Ann and Hannah remain living at 100 Adelaide Road with two lodgers and a servant. (1) London Gazette, 5 September, 1851. (2) Official Catalogue of the Great Exhibition of the Works of Industry of All Nations (1851), pp. 33 and 55. (3) 25 Jan. 1853, no. 186 in Patents for Inventions. Abridgements of Specifications Relating to Roads and Ways. A.D. 1619-1866 (1868), p. 106-107. (4) James Thorne Roe (born 1844), Timothy Thorne Roe (born 1845 Camberwell, baptised 25 Oct. 1845 at Wandsworth All Saints), Mary Ann (born 1847 in Camberwell), Sarah (born 1849 Camberwell), Hannah (born 1851 in Camberwell), and Charles Thorne Roe (born 1852 Wandsworth, baptised 25 Oct. 1845 at Wandsworth All Saints). (5) England & Wales, National Probate Calendar (Index of Wills and Administrations), 1870. (6) England & Wales, National Probate Calendar (Index of Wills and Administrations), 1893. (7) England & Wales, National Probate Calendar (Index of Wills and Administrations), 1891.